Prior to my trip to Ukraine last week, I was extremely nervous - the question in my mind for weeks was, "how bad will Ukrainian International Airlines be?" There's no getting around the facts that this is a small national airline with fairly old aircraft and budget prices. 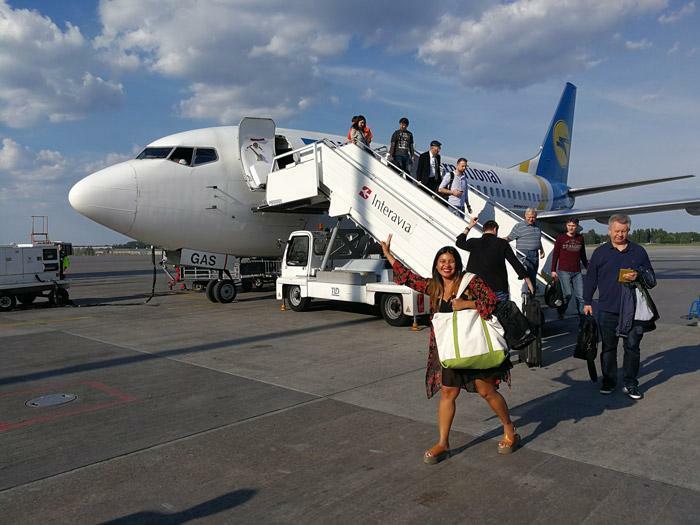 At least in terms of flights to New York from Kiev, it is a "cheaper" way for people to go home to see family and for a handful of business people that want to avoid connections in Europe on the major carriers. If you want a cheap direct flight from New York to Kiev this is your only option and depending on which cabin you happen to have selected seats in you will have a dramatically different perspective on the flight. 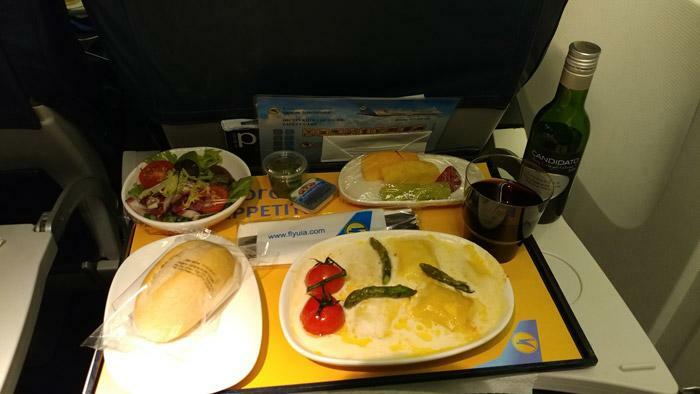 During my week in Ukraine, we had the opportunity to fly two transatlantic flights from JFK to KBP in premium economy, one leg in domestic business class, and three other legs domestic economy on. All of our domestic flights were on variations of Boeing 737s, while the transatlantic flight was on one of their Boeing 767s. 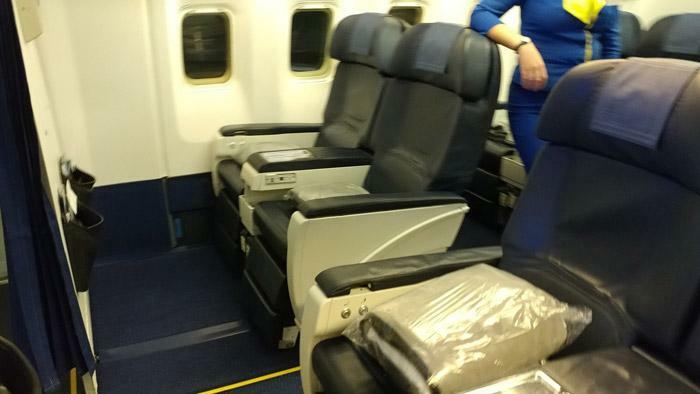 I can't say much for the Ukrainian International Airlines business class except that like the rest of the plane, the hard product is old and not even close to what you'd find on other long haul business class flights. 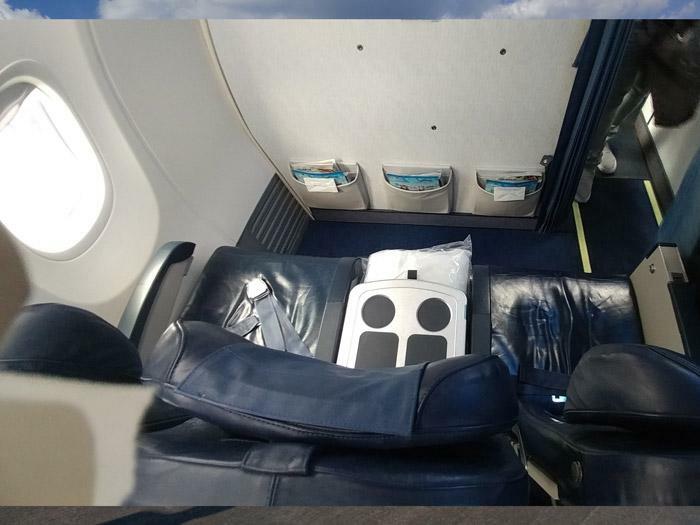 For instance, the seats look a bit narrower and it is not a lie-flat seat, but rather a seat that reclines further than what you'd find in the back. From an informal survey on both transatlantic legs from New York, that cabin appeared to be less than half full. 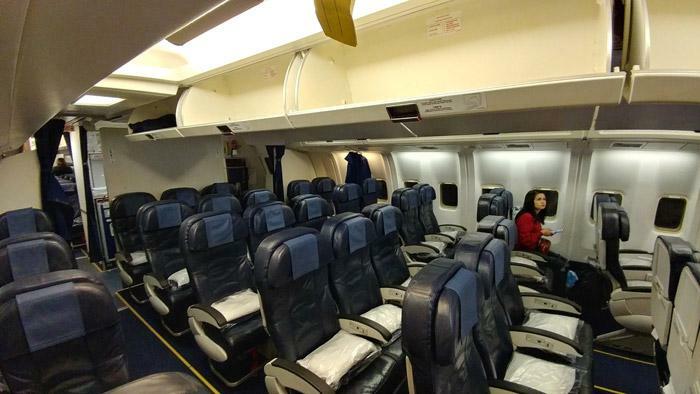 After walking past the two rows of business class seating, you arrive in Premium Economy where I spent my time during the 9-hour flight to and 10-hour flight from Ukraine. It has a 2-3-2 configuration and the seats felt comparable in width and pitch to what you'd typically find on an "extra legroom" seat on an American carrier. The seats were comfortable despite their age and I've had far worse seats while flying. Thankfully, during both to and from JFK our cabin was about half full and quickly after takeoff people spread out. On our night flight to Kiev, I witnessed one family stake out most of the middle seats with mom, dad, and kid each taking their own row and turn it into a bed. This certainly changes the dynamic and is an interesting (though not always deliverable) perk to this section. From talking with other people, it is often similar depending on the day of the week. 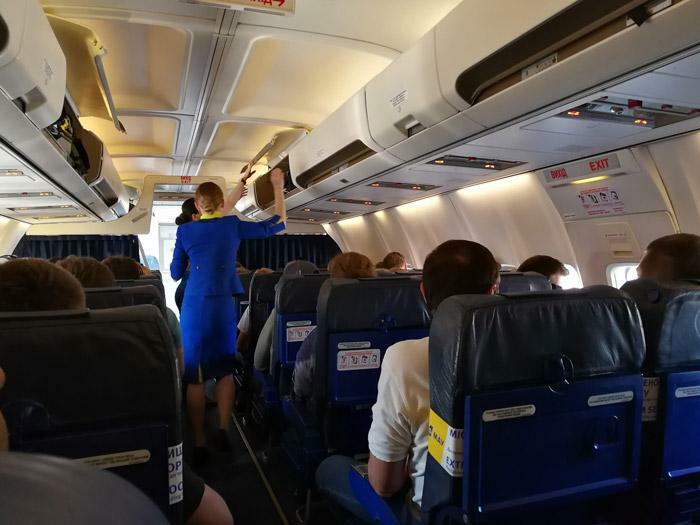 One interesting thing that deserves mention here though is that Ukrainian International Airlines is extremely strict on not just the size but the weight of carry on bags - despite there being PLENTY of bin space in Premium Economy. On my flight over, I had brought a carry on and my backpack. At check-in though, I was told that I had to check the carry on bag since it was way over their limit. After that flight, I checked the FlyUIA.com website and it is somewhat confusing on this topic since it says that hand bags must be maximum of 5kg in weight. (My backpack with laptop was more than this, but maybe there's an exception for laptop bags?) Thankfully though, checked bags are free (1 piece for domestic economy and 2 for international long haul). Maybe I was never flagged on my other flights for my backpack since I just left my "approved bag" tag attached to my backpack and nobody questioned it again. Despite some horror stories that I had read about the handling of bags in Kiev, people in our party had no issues with either excess damage or bags being opened up and items disappearing. My understanding from talking with others is that in the past there was significant issues with corruption in the airport baggage handling but those problems are largely taken care of now and the level of security is equivalent to what you'd expect in any other European or American airport. Moving on from the hard product of our Ukrainian International Airlines long haul flights, the service was very good in Premium Economy. I had no problem keeping my wine glass full and the food was good quality and plentiful. Likewise, the flight attendants were extremely professional, attentive and polite - often more so than what is typical on American carriers ... even for long haul flights. They also spoke near perfect English so with one exception they were able to be conversational and descriptive of the meal choices. In that one example it was humorous because the entree had a Ukrainian name and I asked what it was. The attendant stumbled for the right word and then simply said "veal, it's good!" so I went with that and she was right. A few rows back in economy, the experience wasn't the same however. Here it is clearly a product that is being produced to hit as low of a cost as possible and every one of our fellow travelers complained about the product to the point where they would prefer never to fly it again. It is a cramped 2-4-2 configuration and I can say that even from my brief journey back to take some photos that the aisles too were super narrow to the point where it wasn't comfortable going any further. 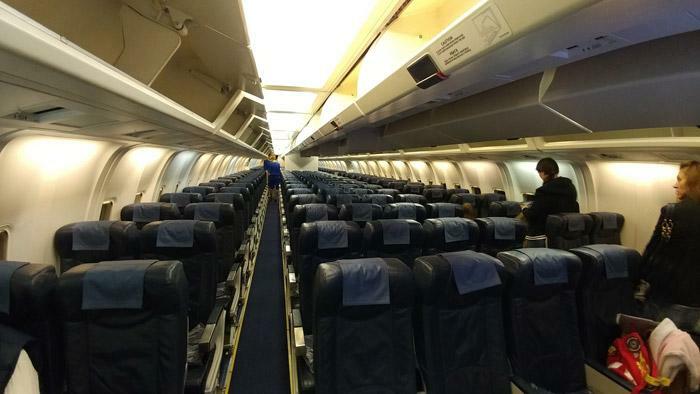 Unlike Premium Economy and Business Class, the Economy Cabin was nearly completely full on both flights - only adding to the discomfort of being jammed together for 10 hours at a time. 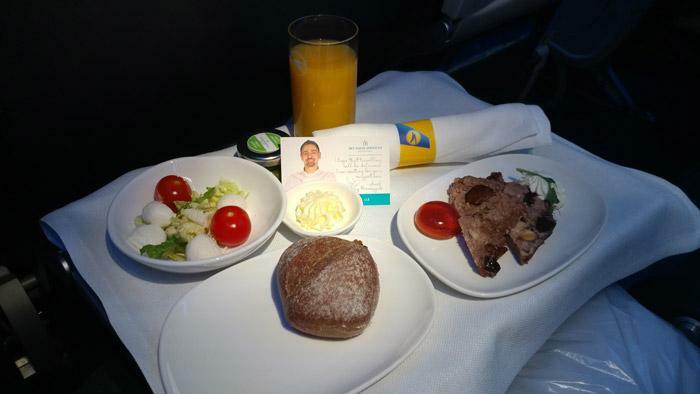 In Economy Class on Ukrainian International Airlines, you still get two meals but presentation is scaled accordingly. You can also pre-order a for-fee meal choice too. Paid bar and snacks are also available for purchase, only coffee, tea, juice, and still water are complementary. Domestic flights within Ukraine were similar to what you'll find with any other European domestic service - though like the long haul flight from New York, our planes were generally pretty old. However we did get one newer 737 though, so it appears that Ukranian International Airlines is in the process of modernizing the fleet. 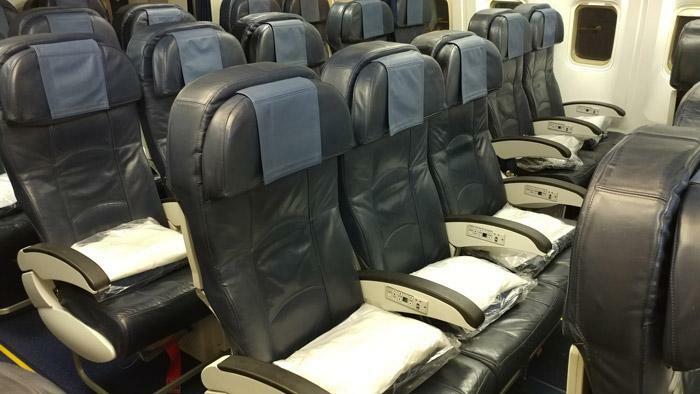 Business Class domestically was the standard economy seat with a spacer between the two seats. 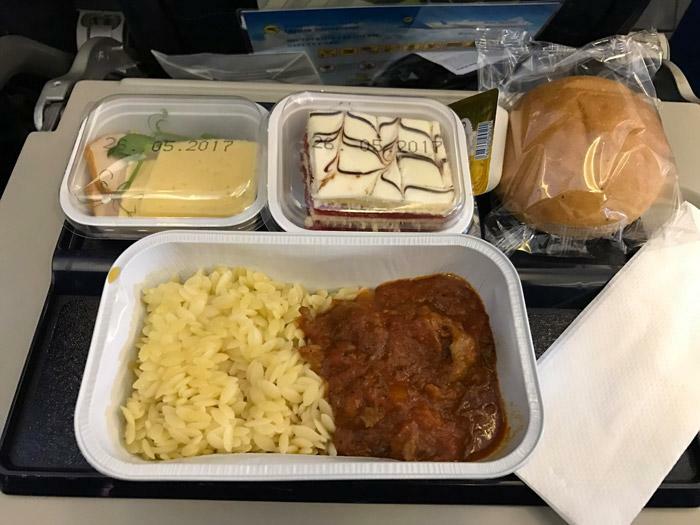 One thing I love about Business Class in Europe is that even on short flights - such as this one from Kiev to Odessa - they managed to find time to serve a full meal. It was almost comical though since service began as soon after takeoff as it was safe to walk around and then was still going on right up to the point where the captain turned on the seat belt sign for landing. It was good food though and I'm now addicted to the Ukrainian pesto dressing that I would then find on various salads throughout the week. Economy Class domestically, again is what you'd find on my American or European domestic product - just older in some instances. Once again however, the flight crew was excellent. They were all friendly and spoke great English. Overall, the experience we had on Ukraine International Airlines comes down to getting what you pay for. The aircraft are generally older than other carriers but I felt safer and more comfortable than I would have on "budget carriers" in the US like Spirit and the crew was always friendly. Ultimately, the choice is up to you when it comes to booking an airline ticket and cost is but one factor. When looking specifically at fares out of NYC, they are the only ones that offer a non stop flight directly to Ukraine and they do so at a slightly less expensive cost for both Economy and Premium Economy classes. However, the biggest advantage for me, is that they offer non-stop flights to Kiev - something other carriers do not. That in itself saves five or more hours including the hassle of having to clear security an extra time and the stresses of boarding / unboarding and dragging your bags through the airport. As wonderful as London, Paris, and Munich are - I'd prefer to avoid dealing with connections there.